Are you a Fuel Up to Play 60 school? If so, you are eligible for an NFL FLAG-In-School Kit! The kit includes 10 footballs, 50 flag belts, 3 kicking tees, an NFL FLAG poster, participation certificates and a flag football curriculum. To apply, go to the My Funding section on your Fuel Up to Play 60 dashboard. Available to all K-12 educators to apply for $10,000 in Action Based Learning or Kinesthetic Classrooms. Reuse your milk and juice cartons to make an innovative garden at your school through the Carton 2 Garden grant. K-12 public and private schools are eligible to apply and 15 schools will be selected. Are you looking for ways to increase parent involvement? Apply for the Parents for Healthy Kids Grant to provide opportunities for parents and kids to engage in physical activity and nutrition education together. Looking for shade for an outdoor space? The American Academy of Dermatology Shade Structure Program is awarding schools and non-profits with the opportunity to install permanent shaded areas. All schools that serve students in K-12 are eligible to apply for funding to use towards a new or existing garden. All K-12 public schools are eligible to apply for funding to design a variety of gardens such as windowsill gardens, vertical gardens, raised beds, greenhouses, and more! The Riding for Focus Program is designed to provide middle schools with a six week cycling curriculum that meets national physical education standards, 20 bikes, 20 helmets, and a training trip for one to Morgan Hill, California! 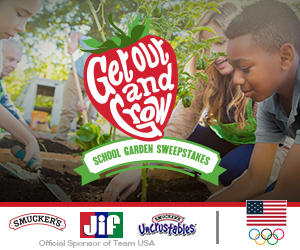 The school garden sweepstakes is open to School Administrators or Foodservice Directors of K-12 schools. Grants for physical activity and nutrition initiatives that support K-12 schools efforts to improve school and student health.